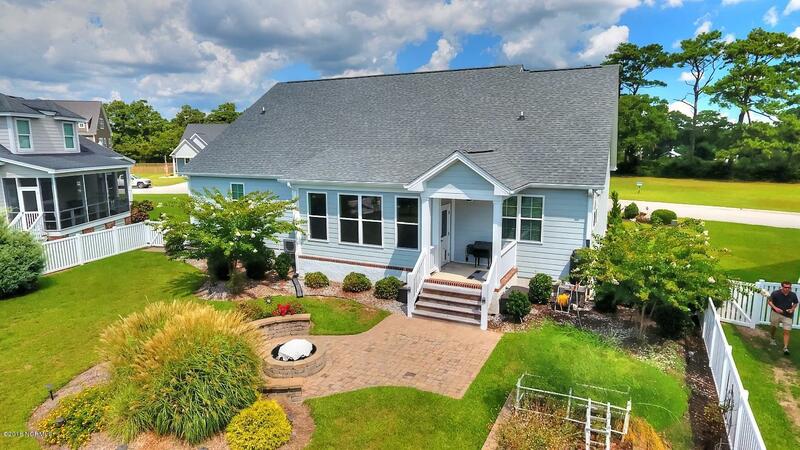 There is simply no other way to put it than to say 1816 Olde Farm Road is a dream home come true. 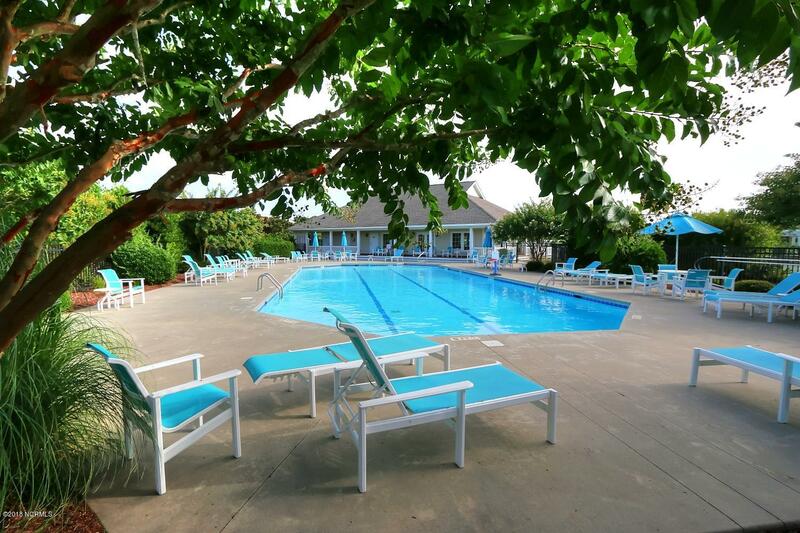 The house, its amenities, professionally landscaped yard all of which are located within a waterfront subdivision that offers day dock, clubhouse, swimming pool and tennis court. This dream home is for real! Come to see for yourself. 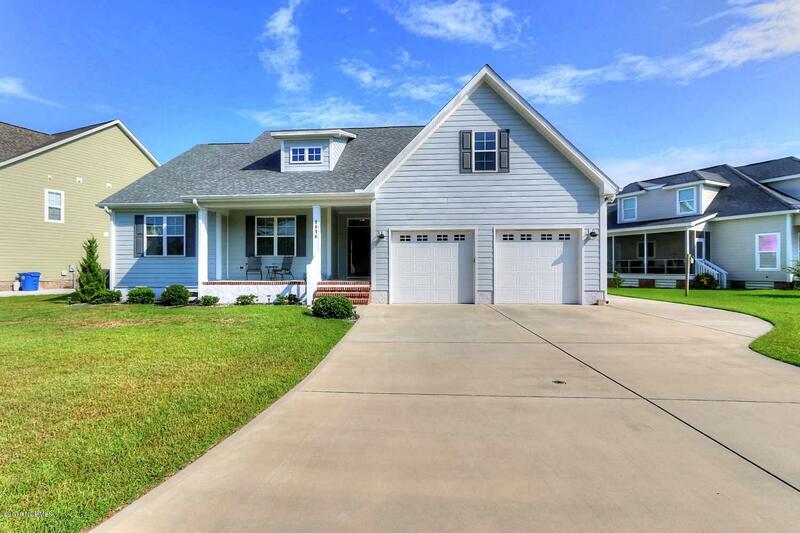 1816 Olde Farm Road is located in the highly sought after Mariner’s Pointe subdivision. 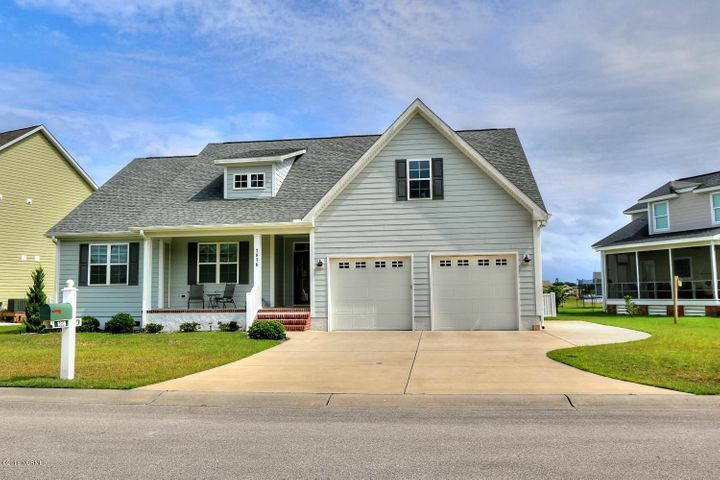 It is a waterfront subdivision located on a peninsula just north of the heart of Morehead City. 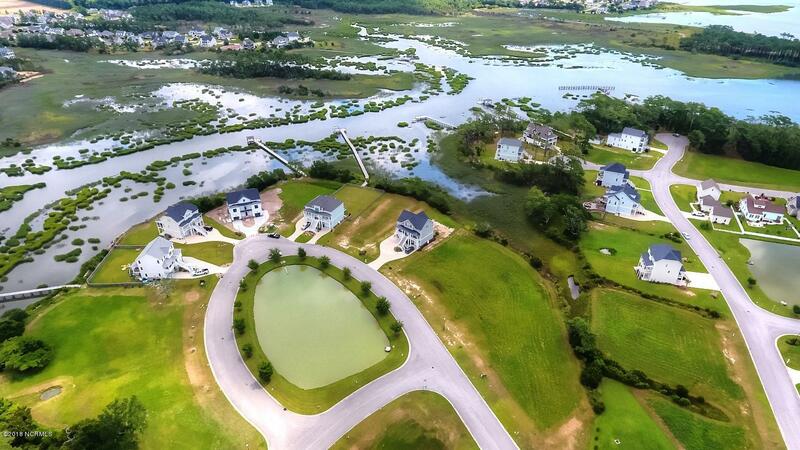 This upscale community is surrounded by Dennis Bay, Crab Point Bay, and Calico Bay. 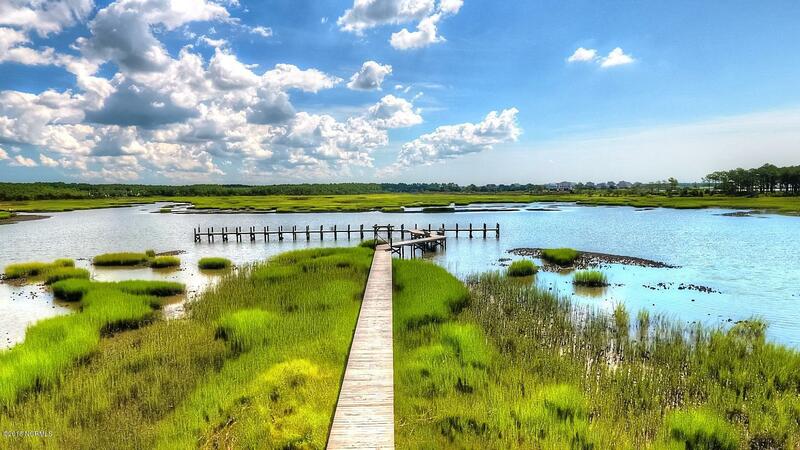 These waters are just off of the Newport River, the Intracoastal Waterway (ICW) and behind Beaufort Inlet. 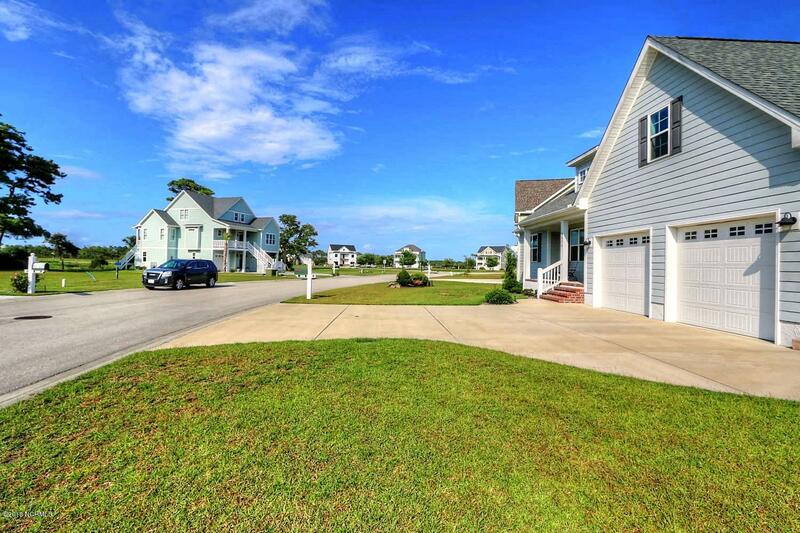 The subdivision has a large day dock available exclusively to its residents. 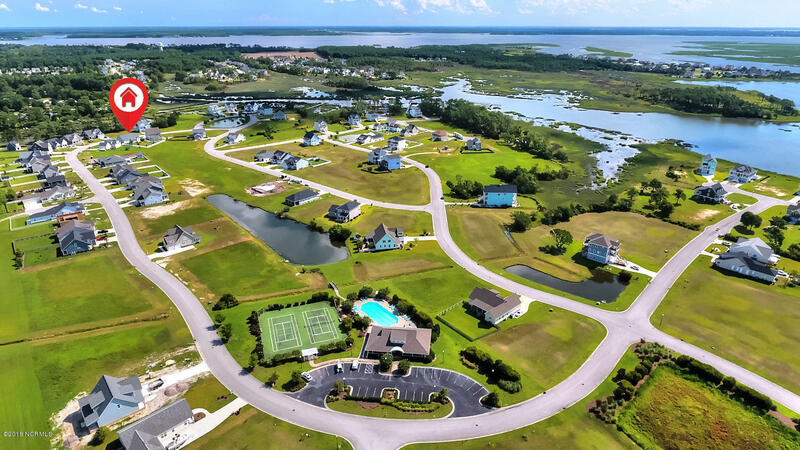 Due to its close proximity to town and the ICW, Mariner’s Pointe gives quick and easy access to all the Crystal Coast has to offer, either by car or boat. 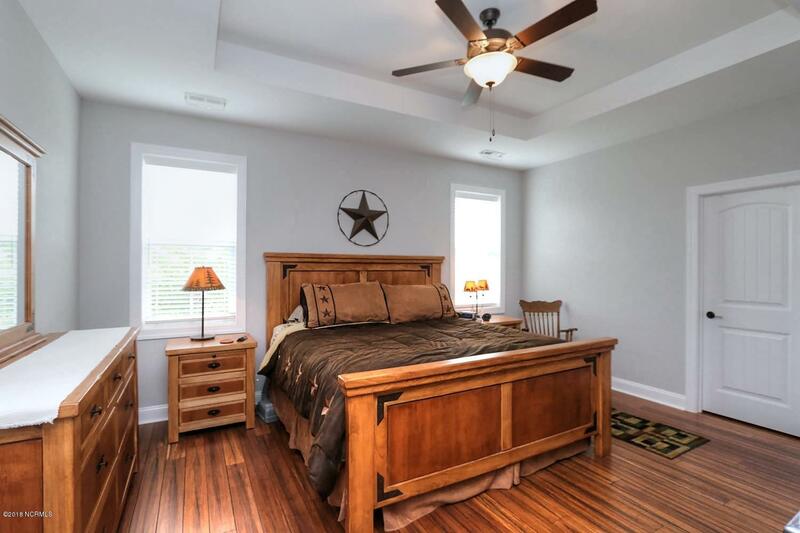 1816 Olde Farm Road is only 4 years old and in pristine condition. 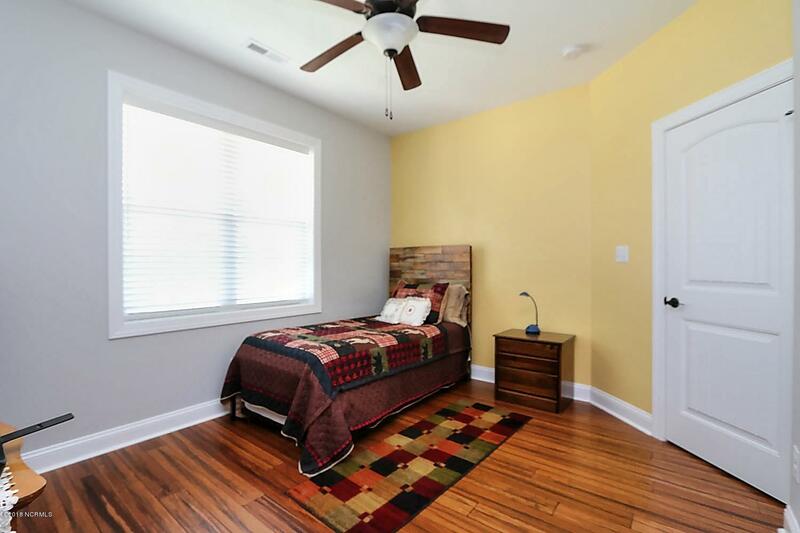 It is a 1.5 story home with 2,260 of heated square footage. 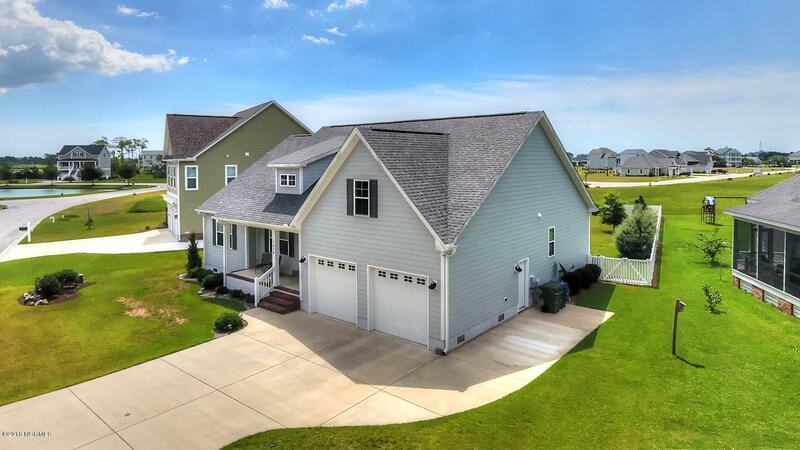 It is a 3 bedroom, 2 bathroom home, a 2 car attached garage with a finished room above the garage (FROG). 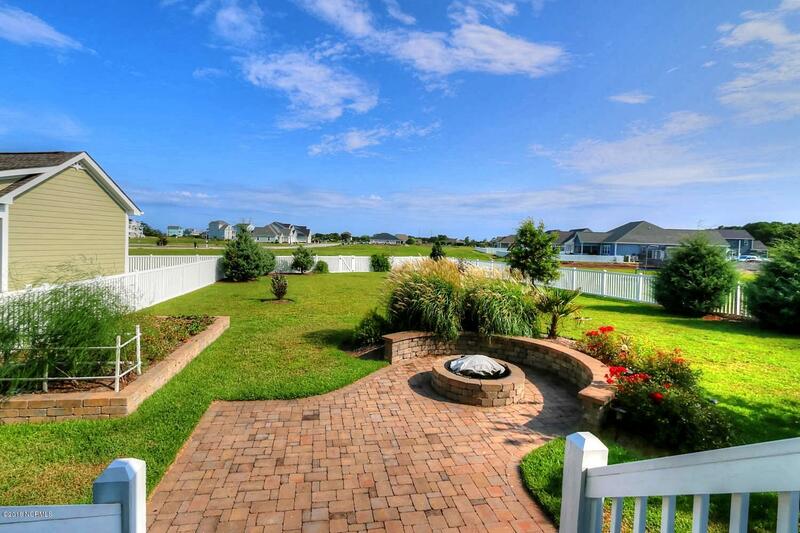 It has 0.32 acre of beautifully and professionally landscaped yard. 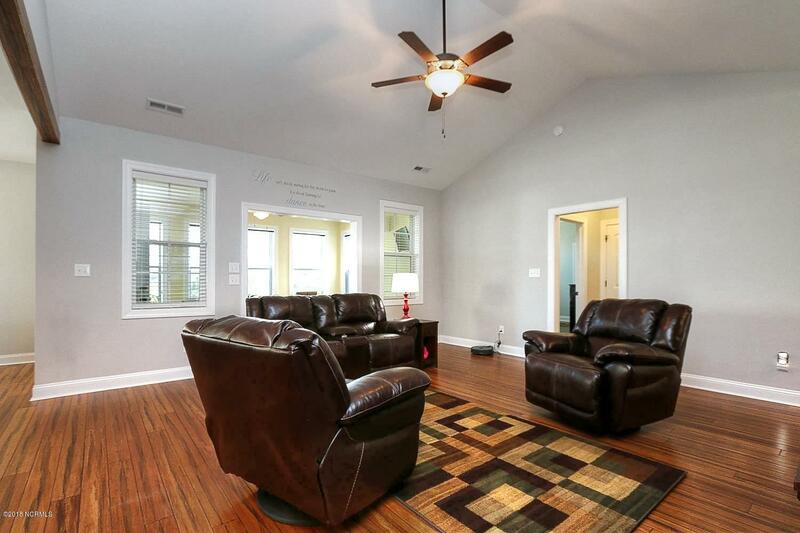 Entering the home from the southern style front porch and through the foyer, you will discover the beautiful living room, with vaulted ceiling and impressive antique distressed strand bamboo flooring. 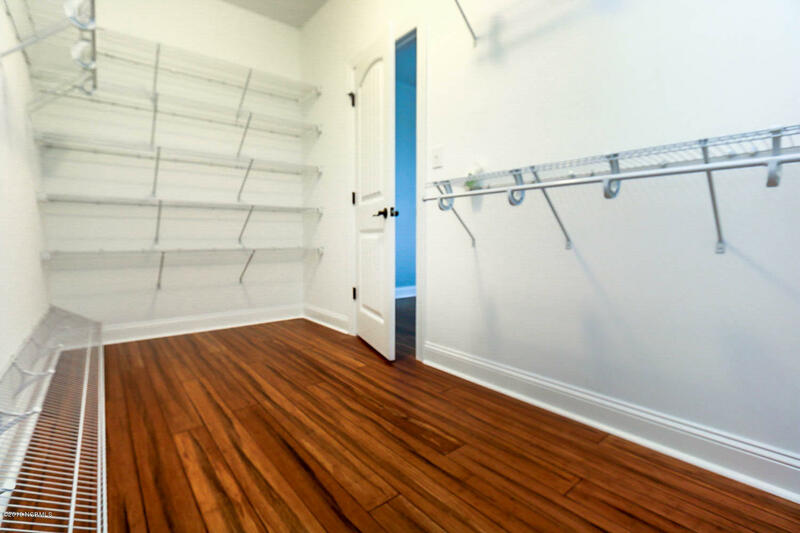 This flooring runs through a greater portion of the home. The window blinds are all cordless Levolor blinds that also run throughout the home. 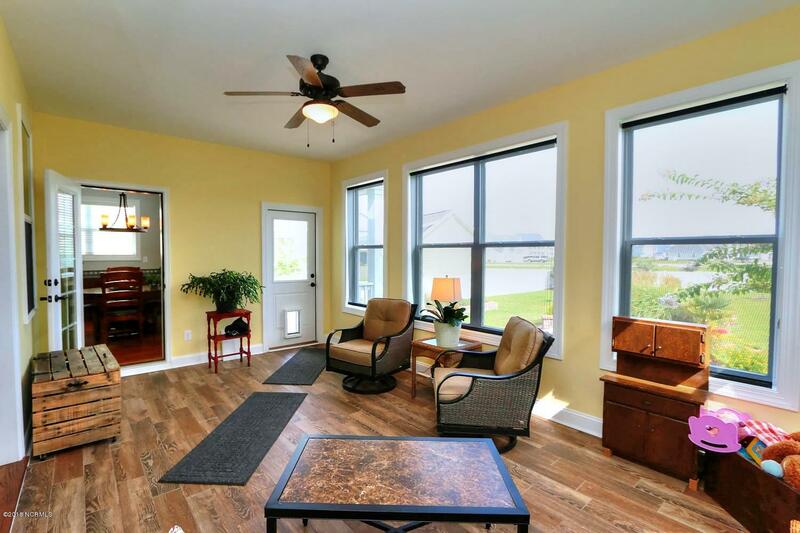 On the south side of the living room is the sunroom and its many windows and access to the landscaped backyard. 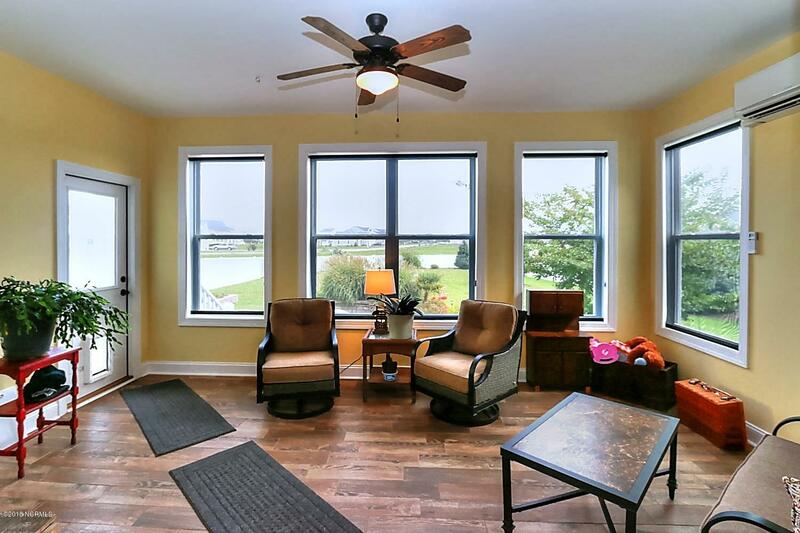 This sunroom is a conversion from a screen porch that was completed by the builder. 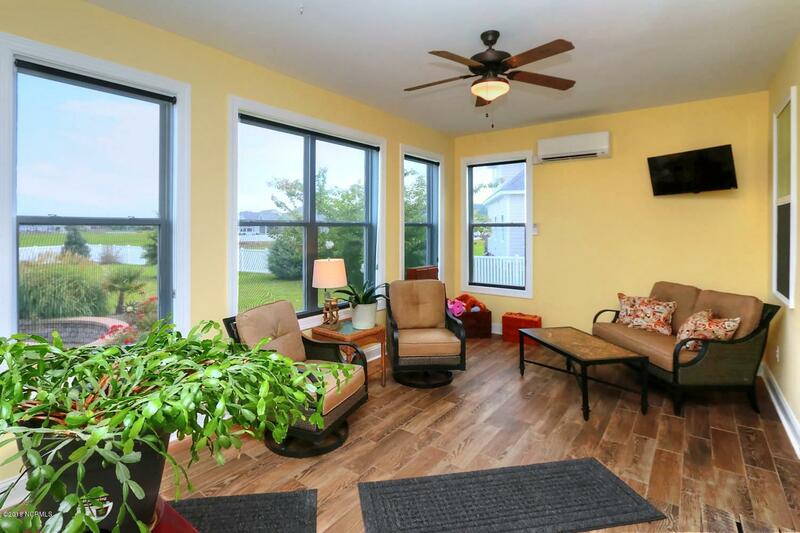 The sunroom comes complete with heat and air so you can enjoy its comfort all year long. 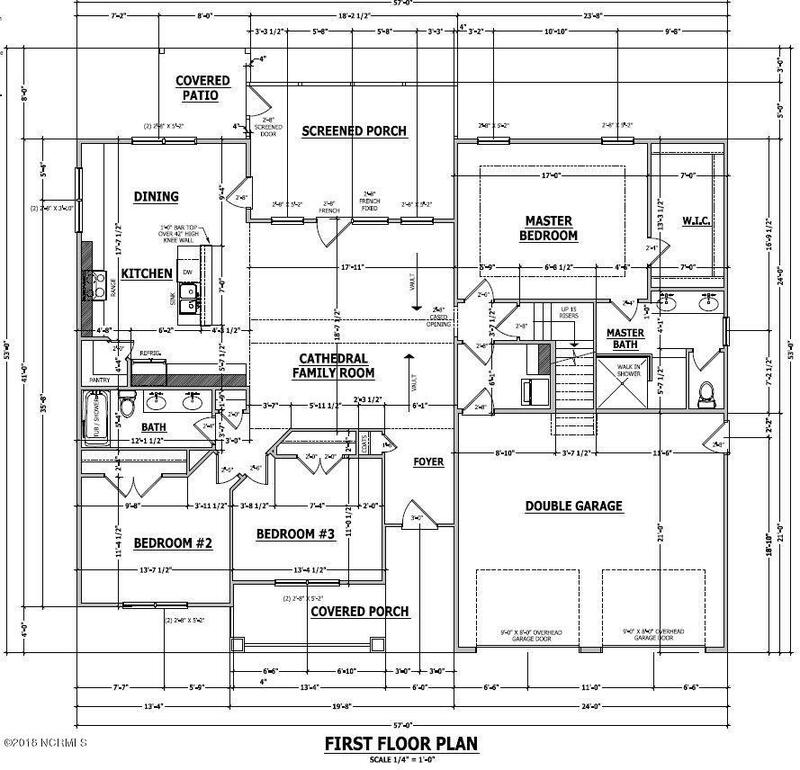 On the east side of the home, you’ll find the kitchen and dining room. We’re going to take some extra time here so as to do justice in describing one of the more impressive kitchens you can find. 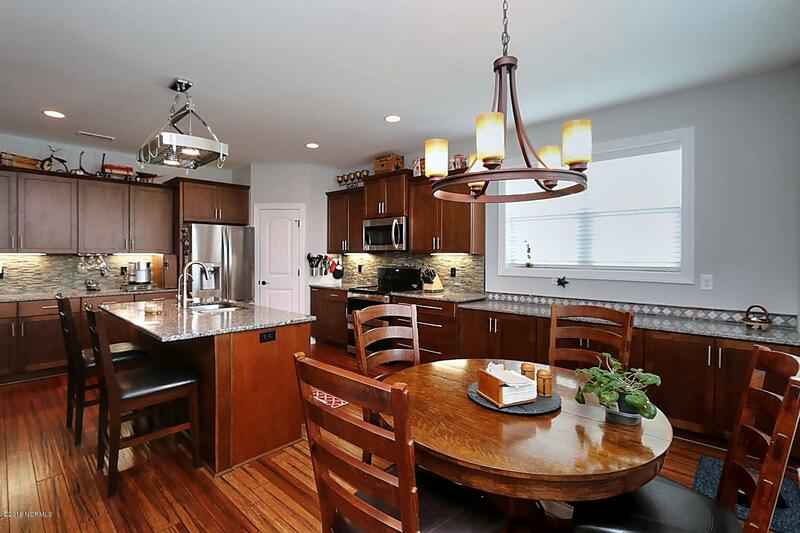 This fabulous chef-designed kitchen is the heart to this beautiful home and has all of the upgrades you could imagine! 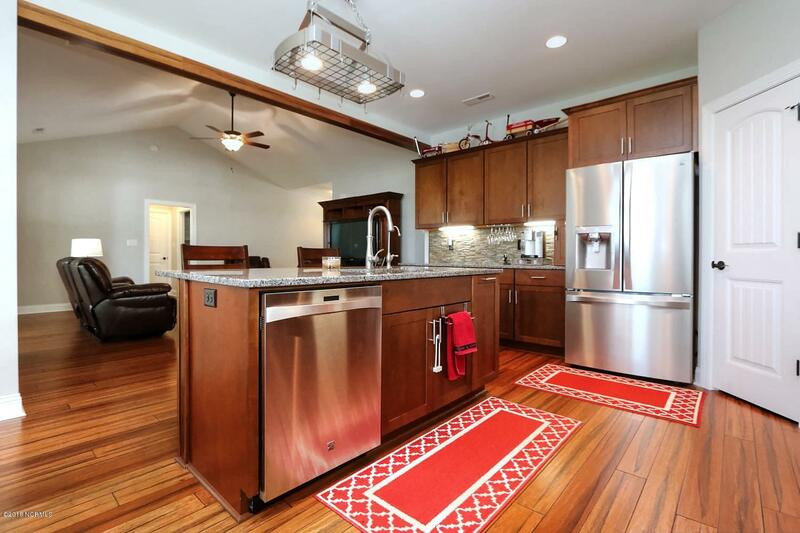 The kitchen has antique destressed strand bamboo flooring. 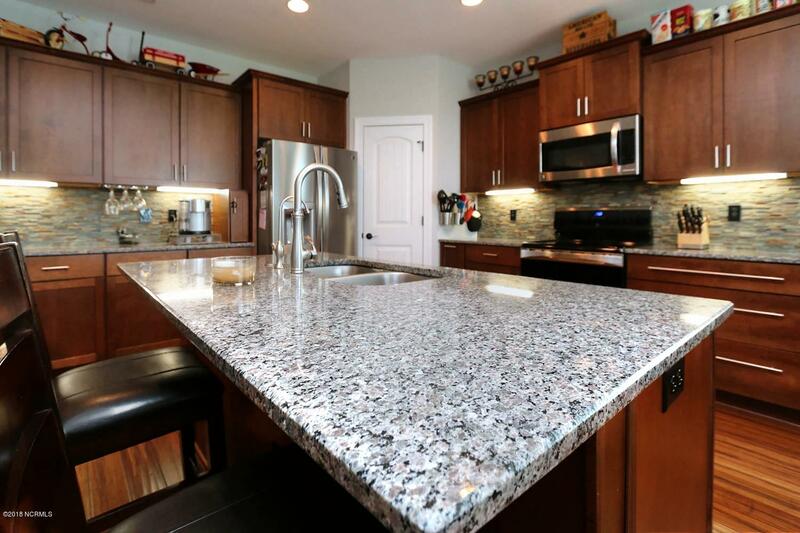 It has granite counter tops throughout with a layered stone backsplash! 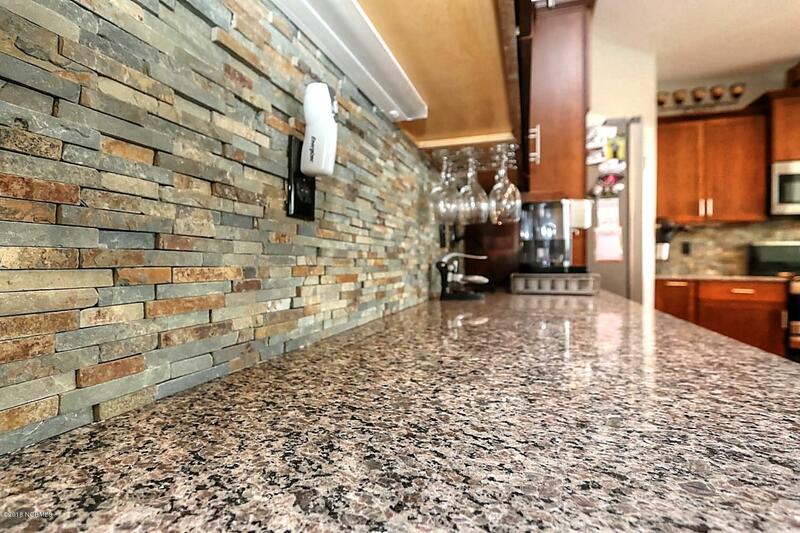 The gorgeous granite counter top with cabinets underneath runs all the way into the dining area. 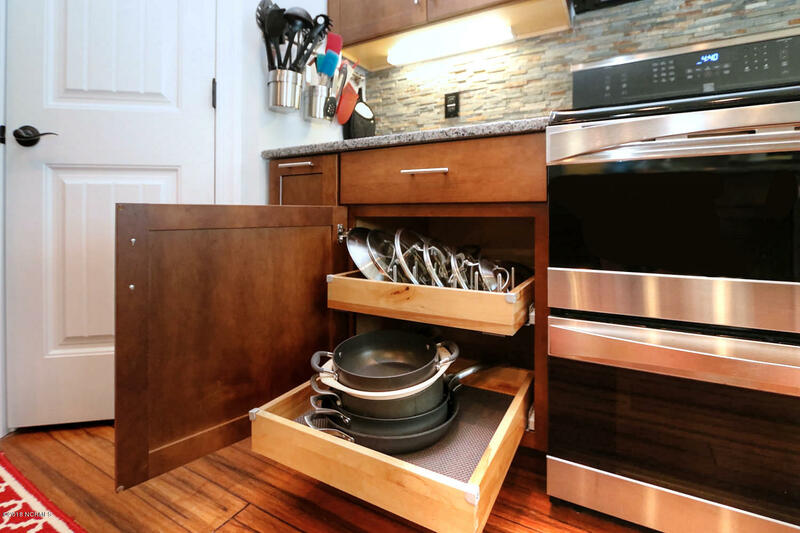 There is also a granite top kitchen island with sink, a dishwasher underneath a stylish stainless steel cookware rack above and finally, 2 matching chairs to go with the kitchen island making it a perfect lunch or snack area. 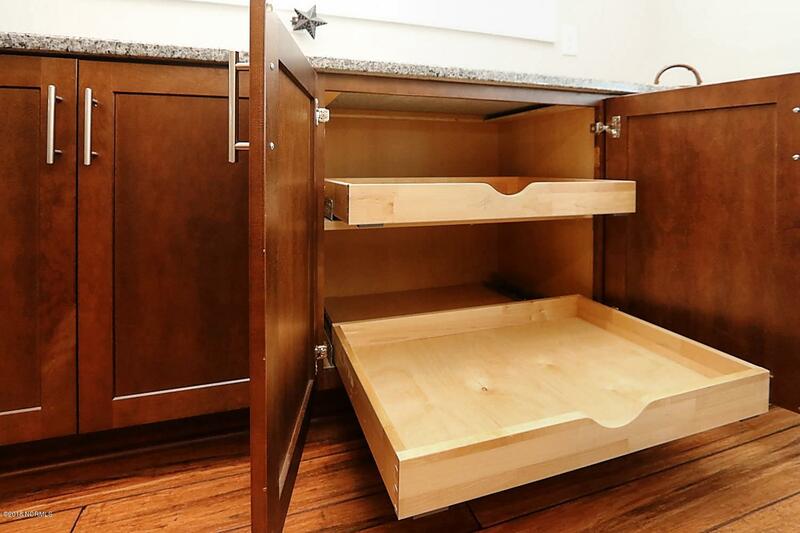 There are ample cabinets with under cabinet lighting. 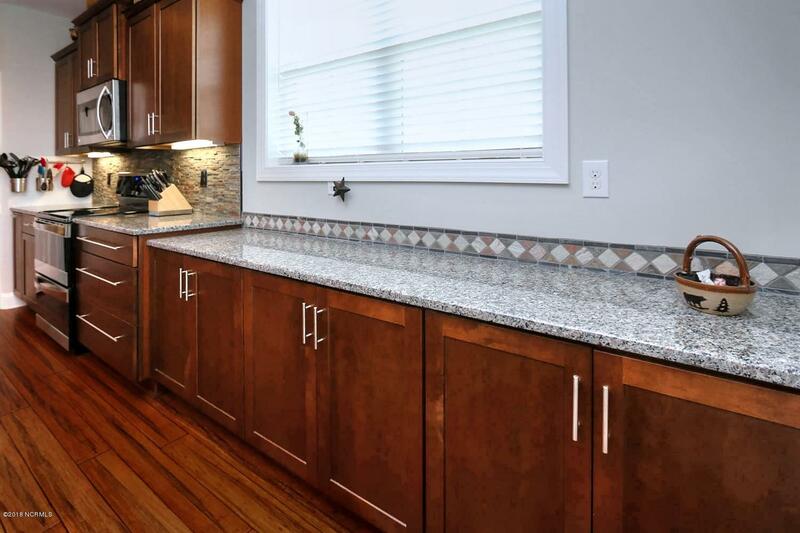 Rounding out this beautiful and functional kitchen are stainless steel appliances, a double oven, and a large pantry. 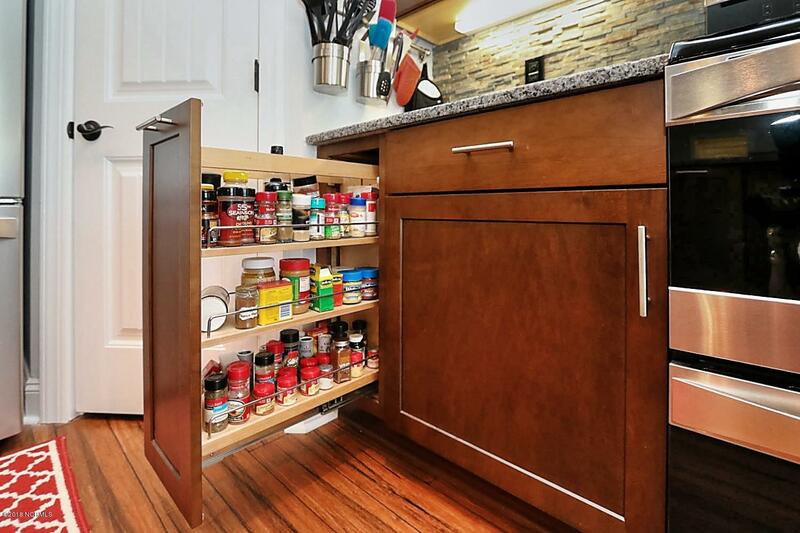 And this description would not be complete without mentioning the very convenient shelves and a spice rack that roll out from the cabinetry. 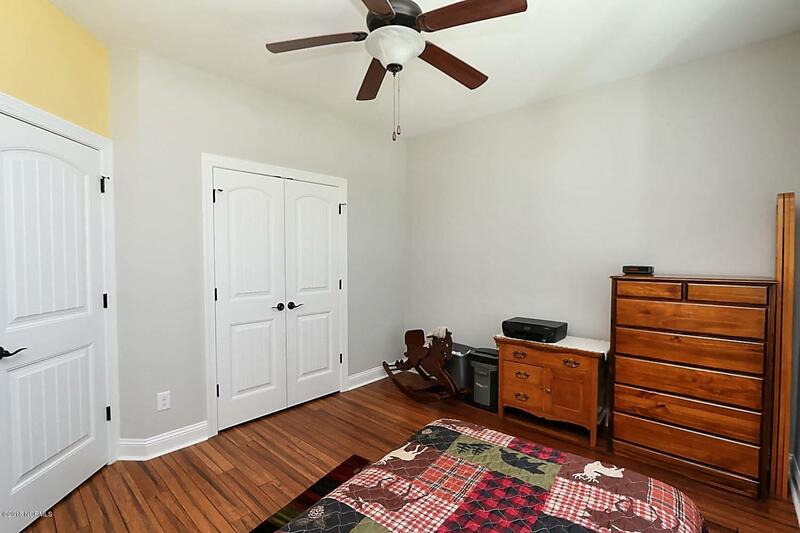 The adjacent dining area has the same great flooring, the countertops, and cabinets from the kitchen as mentioned earlier and overhead lighting. 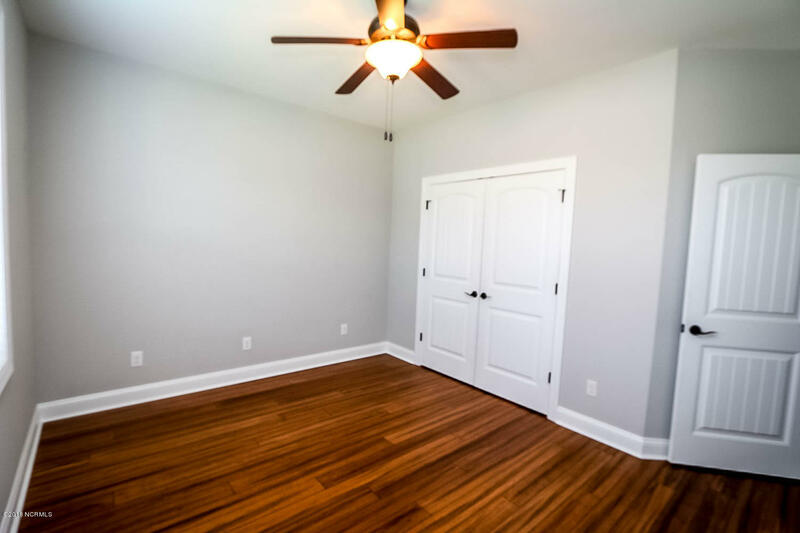 Also on the east side of the home are the second and third bedrooms with bamboo flooring, walk-in closets, and ceiling fan. 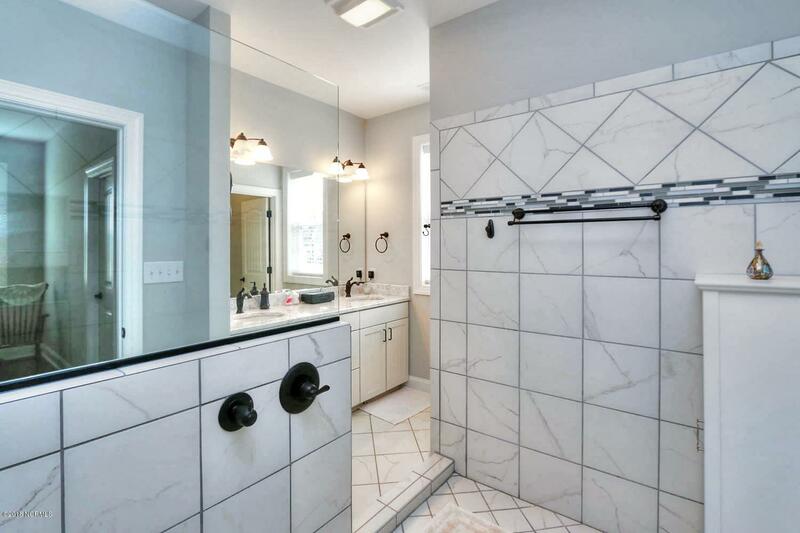 These bedrooms share a bathroom that has a large granite top double vanity with large mirror, tile floors, toilet and shower/tub combination. 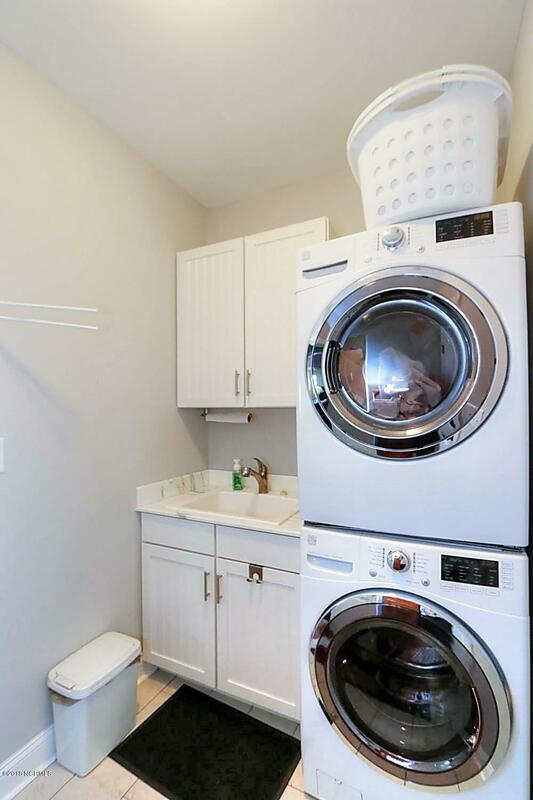 Access to the bathroom can be gained via the living room. 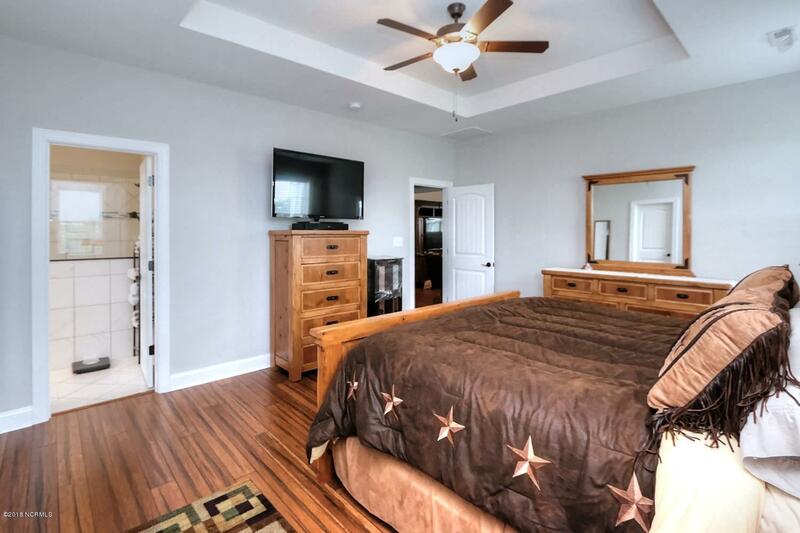 Moving over to the west side of the home you’ll discover the most impressive master suite bedroom and adjacent master suite bathroom. 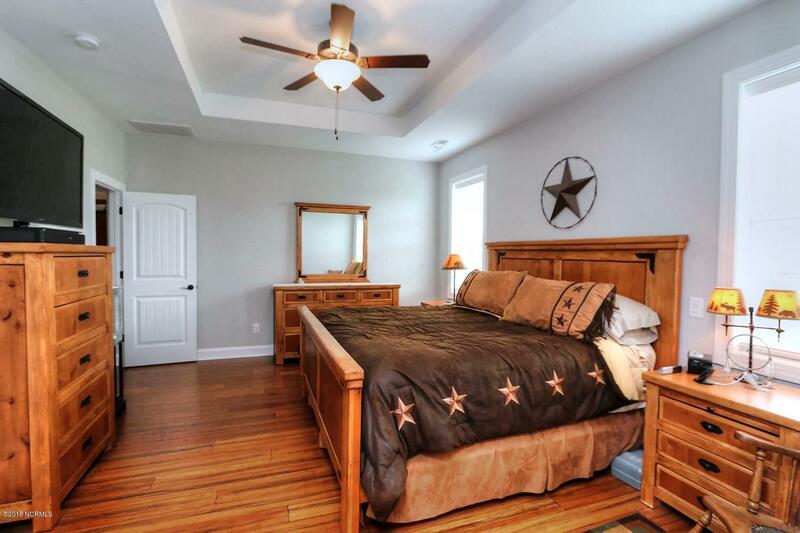 The master suite bedroom has a recessed ceiling with ceiling fan and distressed strand bamboo flooring. 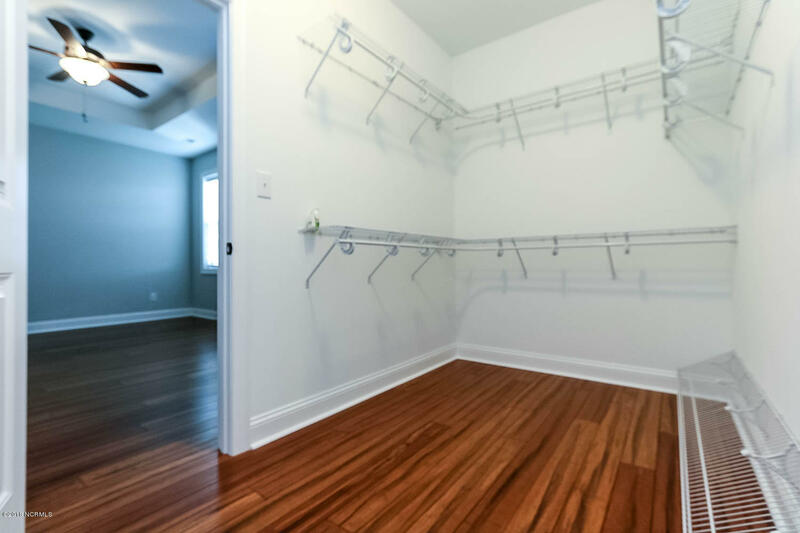 It also has a very large walk-in closet. 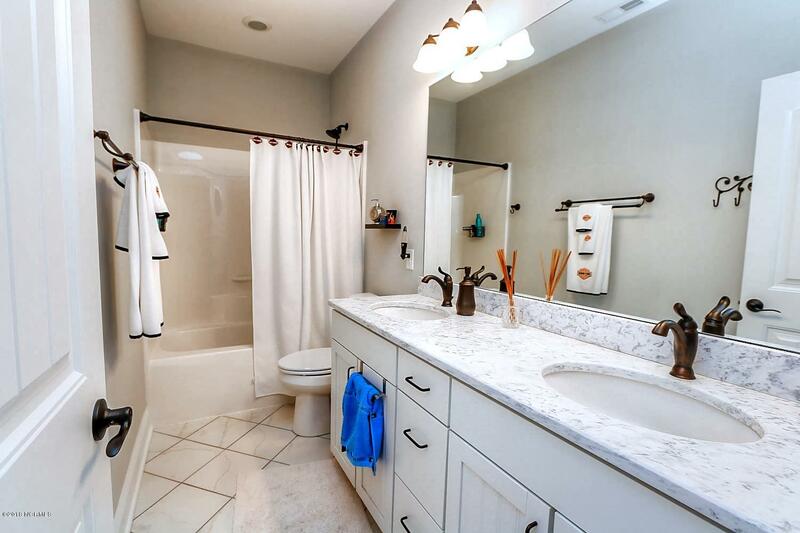 But the gem of the master suite is definitely the most impressive bathroom. 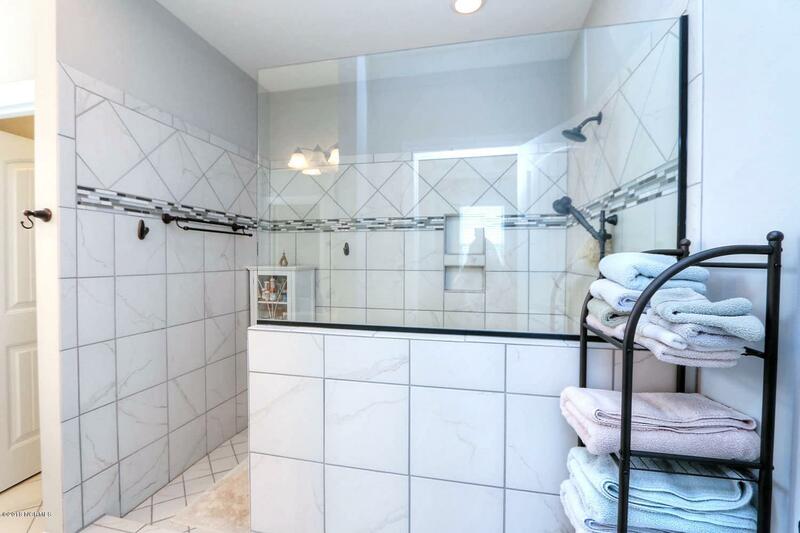 The floor is tiled as well as most of the walls. 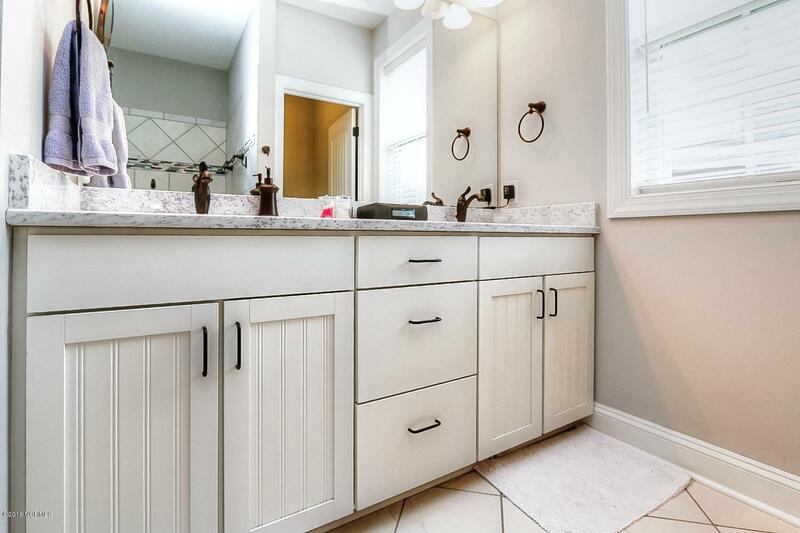 It has a large granite top double vanity with cabinet space underneath. 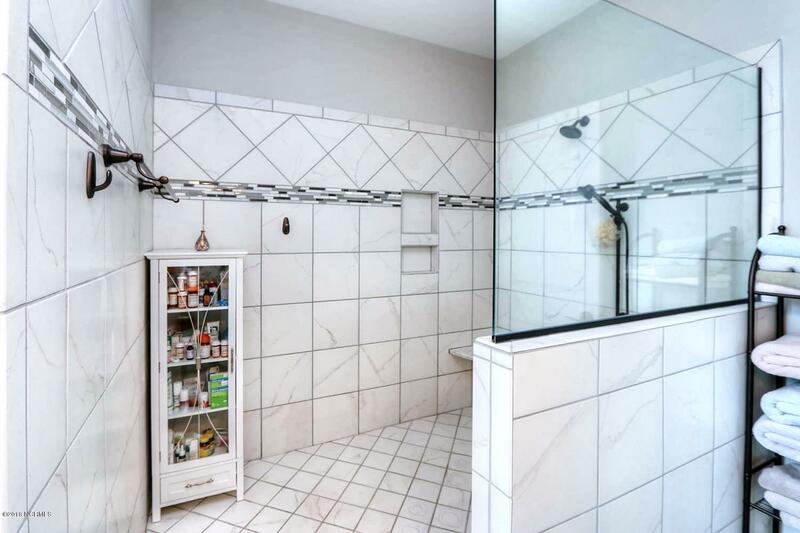 There is a large, tiled walk-in shower with a tile and glass partition. 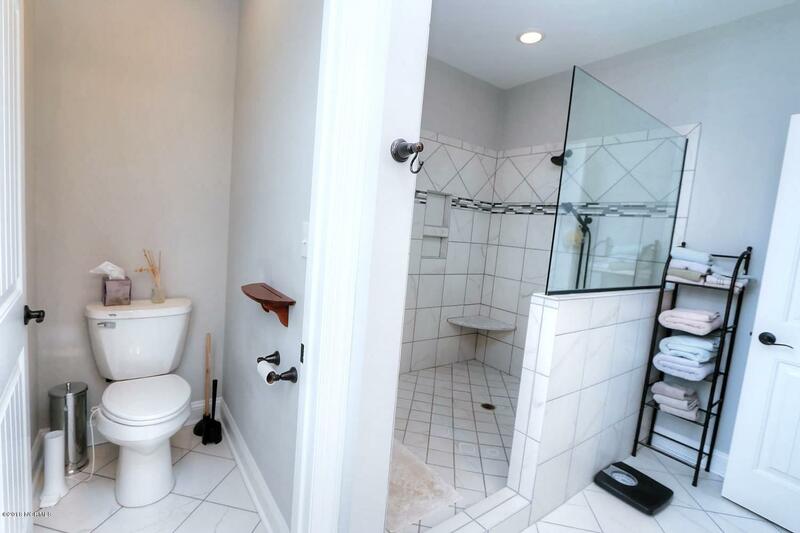 The toilet area is sectioned off in its own private area of the bathroom with its own door. 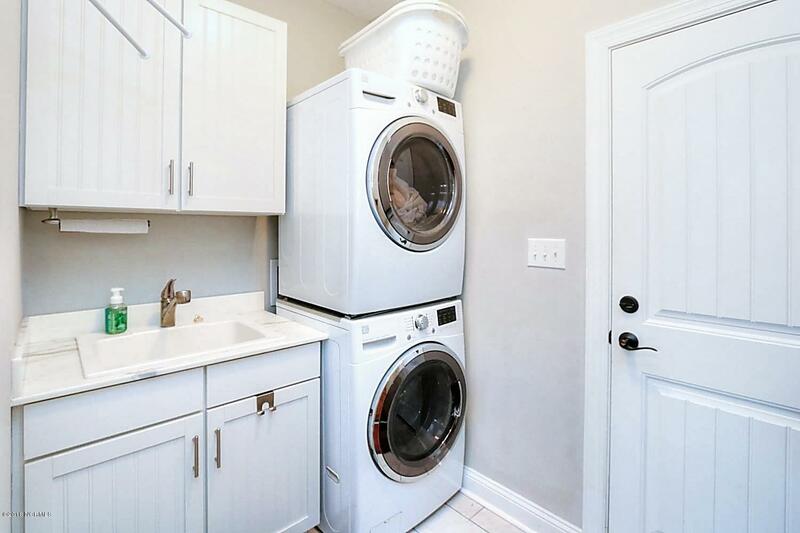 Also on the west side of the house is the laundry room and access to the 2 car garage. 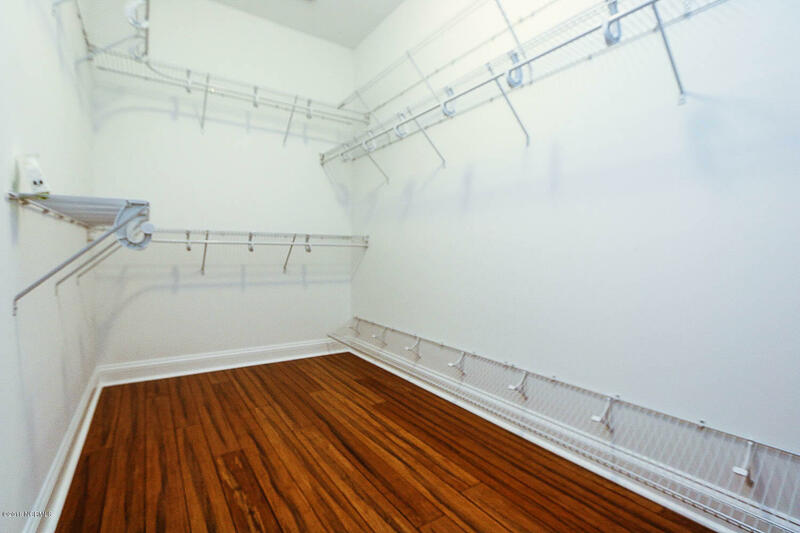 The garage floor has an acid stain making it very easy to clean. 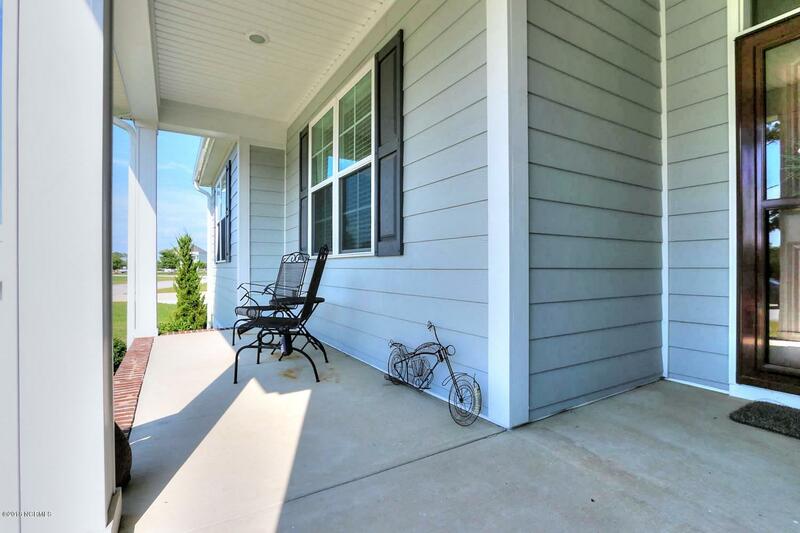 The outside has been professionally landscaped. 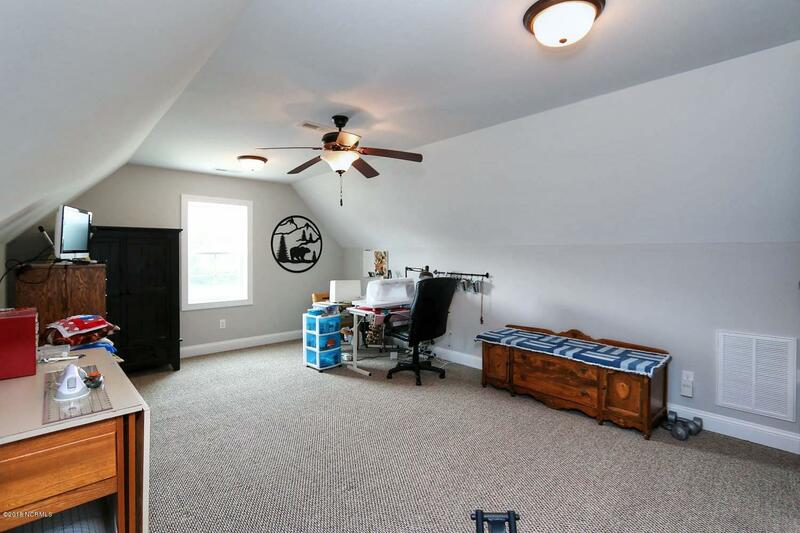 It has a professionally installed fire pit in the backyard. All trees and shrubs are on a drip system for easy watering that comes with a timer. 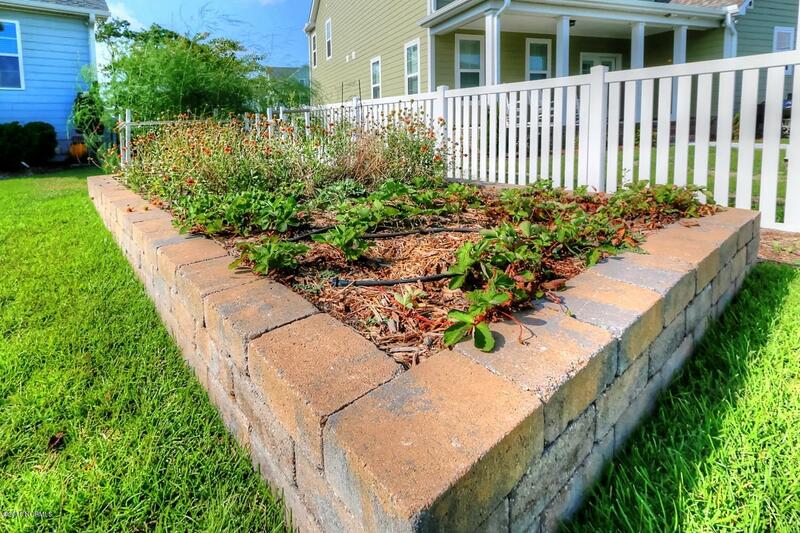 There is a wonderful raised garden bed that has been used for growing strawberries. The current owner will even leave the rain barrel to be used for watering whatever fruits, vegetables or flowers you decide to grow. 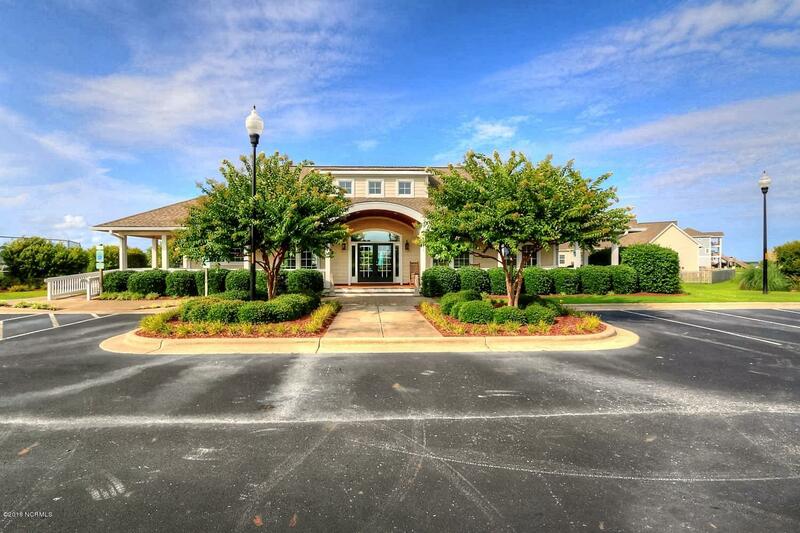 In addition to all of this, the Mariner’s Pointe subdivision offers its residents a fabulous clubhouse, swimming pool, and tennis courts. 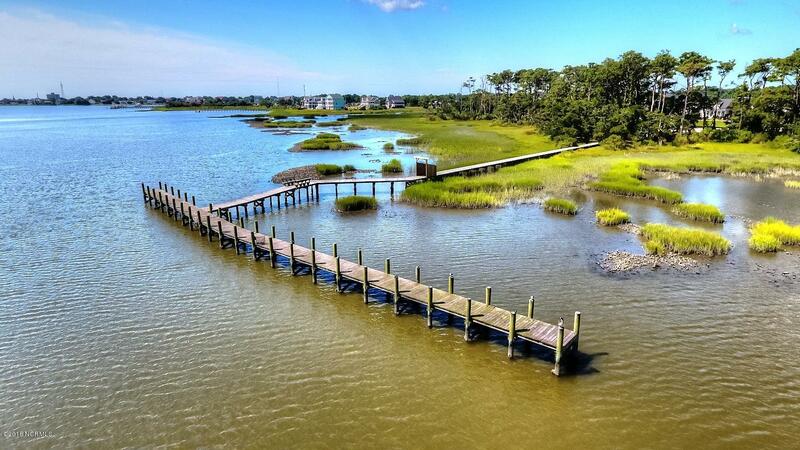 And don’t forget the well maintained day boat docks mentioned earlier! The framing of the house is 2” x 6” giving greater insulation value. 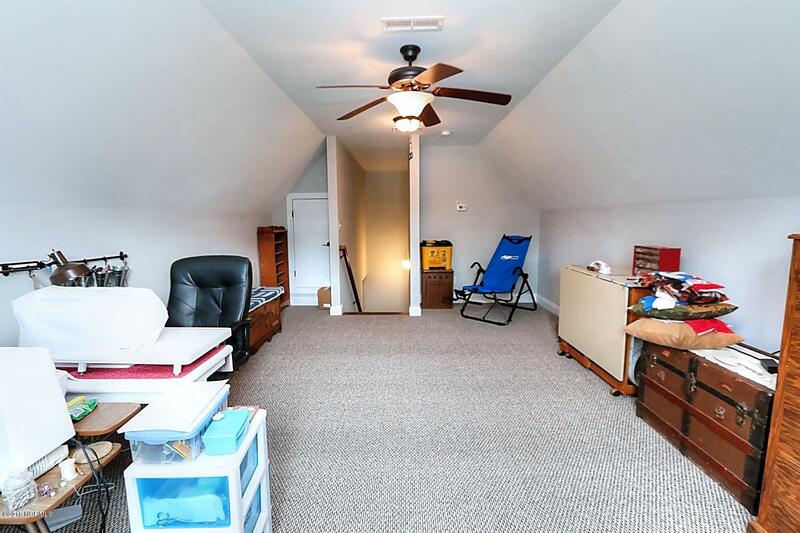 The house is built on crawl space, so it is easy to make modifications. The electric bill for the last several months has averaged $71.00 per month. The home is pre-wired for a generator. City water, city sewer, and city trash pickup. 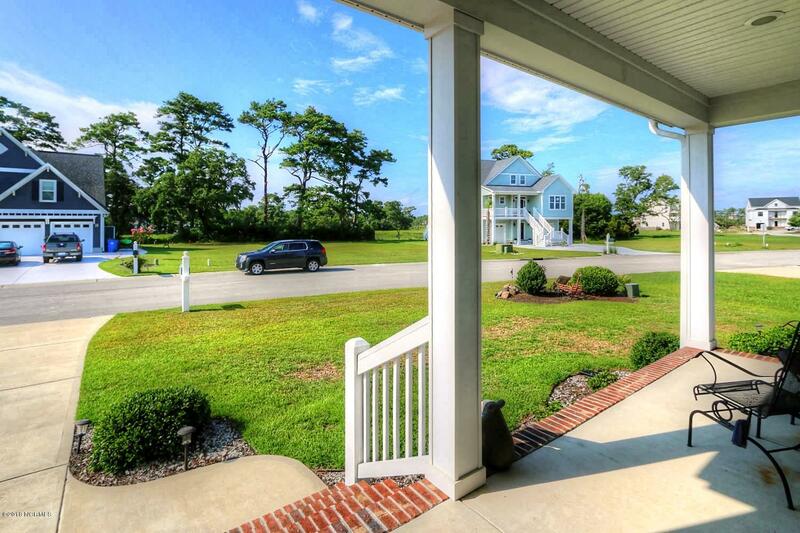 By road, 1816 Olde Farm Road is just a few minutes from downtown Morehead City, historic Beaufort as well as the beautiful beaches of the Crystal Coast. 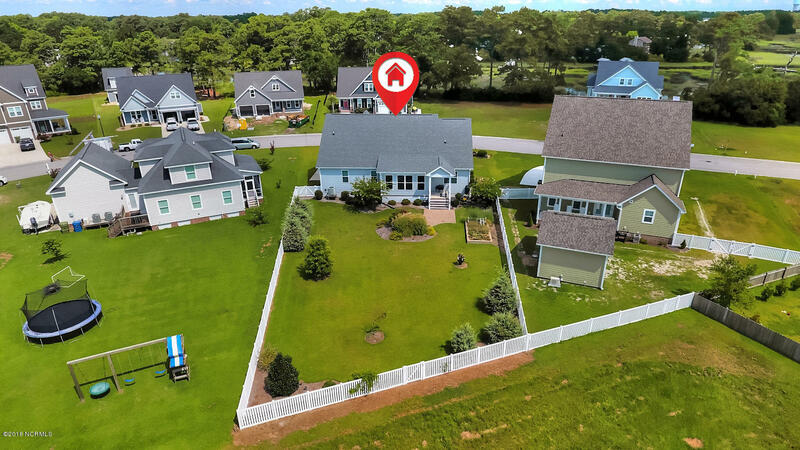 Water access is right from the neighborhood and has you minutes away from the Newport River, Bogue Sound, Beaufort Inlet and the Atlantic Ocean. 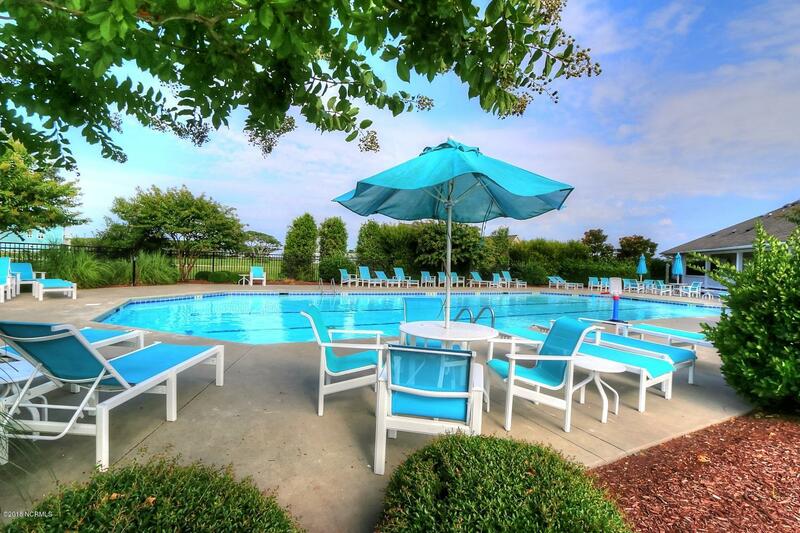 Any way you turn you have quick access to fine dining, world class fishing and boating, shopping, great events and festivals such as the Big Rock Blue Marlin Tournament or the North Carolina Seafood Festival. 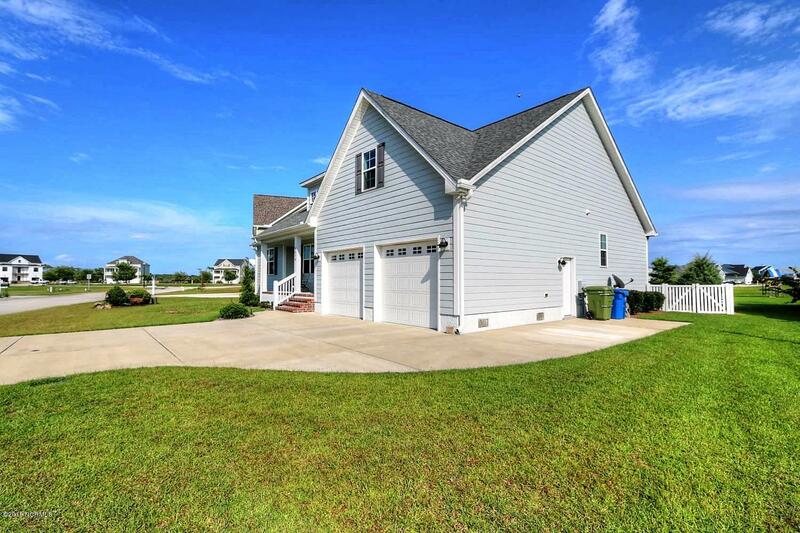 1816 Olde Farm Road truly is a dream come true. 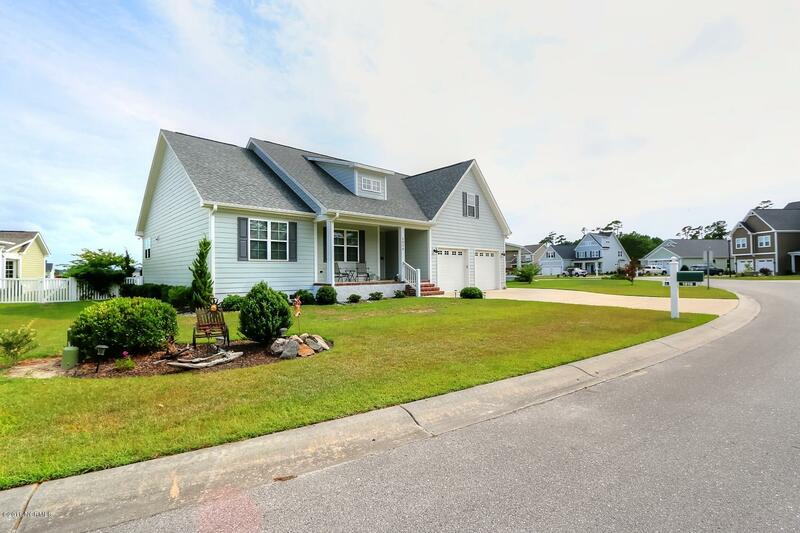 Contact Margaret Hitchcock with Hitchcock Realty today at (252) 648-0300 and arrange your viewing of this great property today! WELL BUILT BEAUTIFUL HOME IN PRISTINE CONDITION-NO HURRICANE DAMAGE OR FLOODING WHATSOEVER! 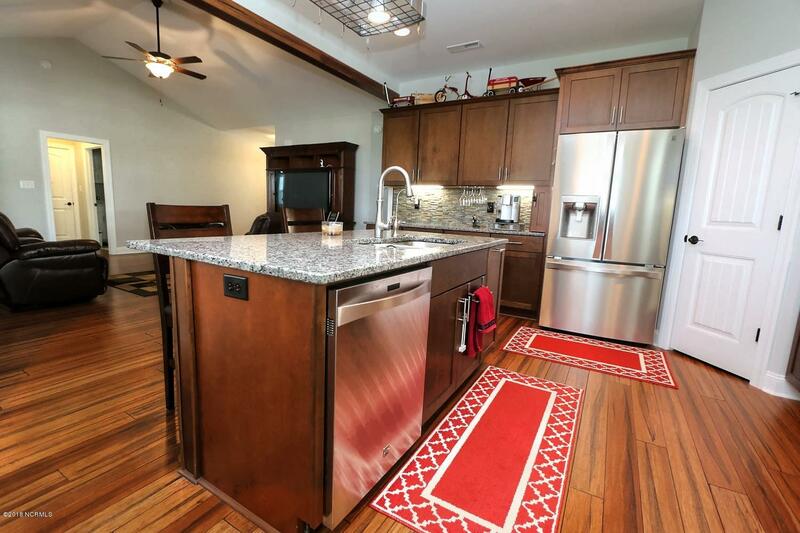 If you love to cook you'll never want to leave this fabulous chef-designed kitchen! 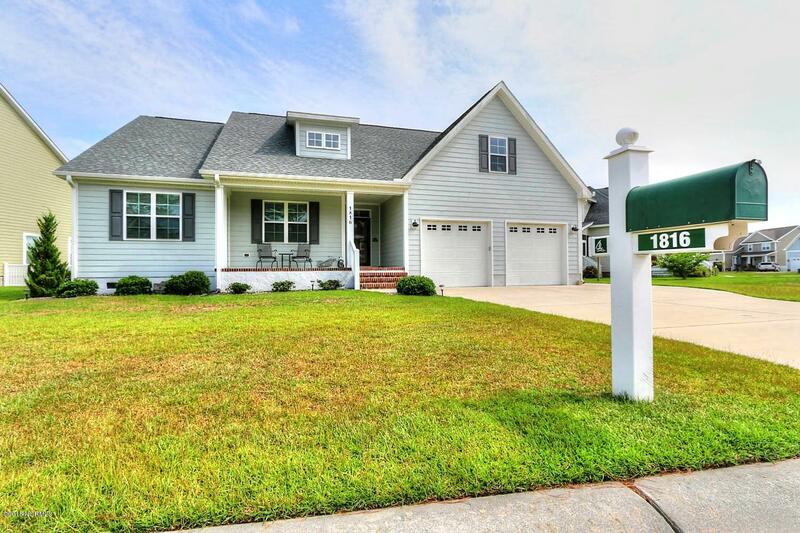 It's the heart to this wonderful home w/ all the upgrades you can imagine, stainless appliances, double oven, LG pantry, granite counters, stone backsplash, beautiful cabinets w/ roll out shelves & spice rack. 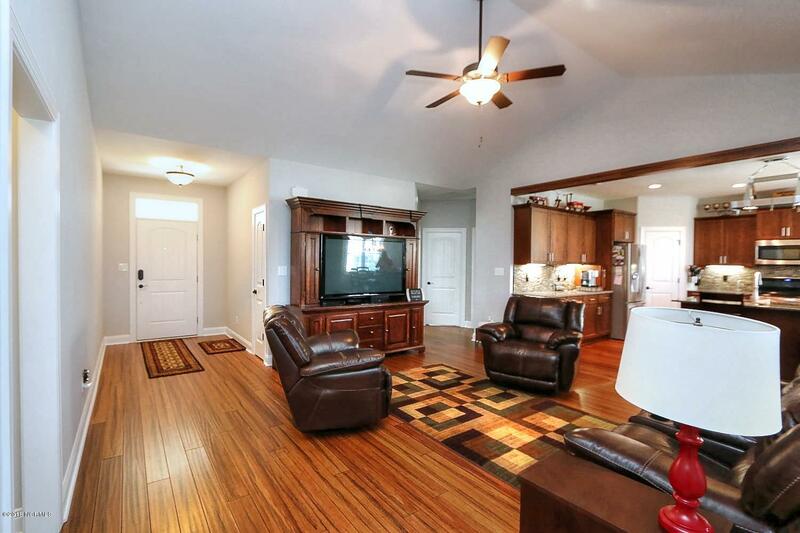 3 BR's, LG bonus room, 2 baths, 2,260 SqFt, LG master suite, 2 car garage & it's generator ready. 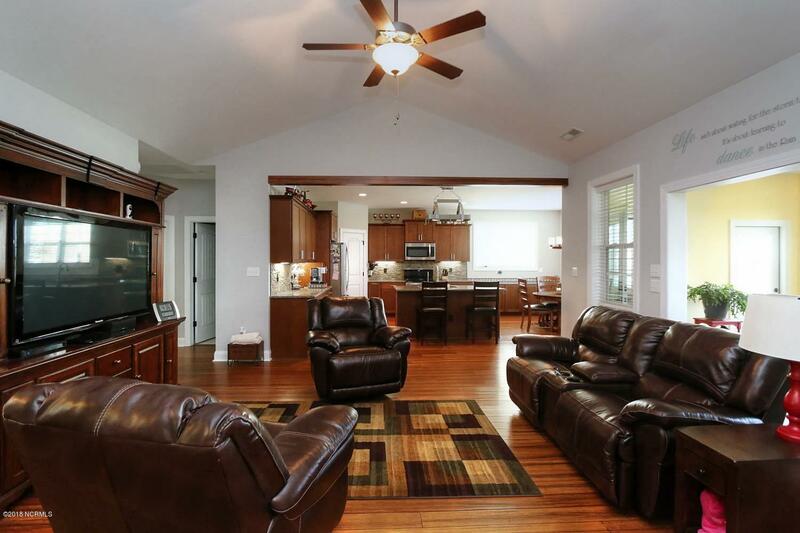 Large sunroom overlooking fenced backyard w/ brick patio, fire pit & raised garden bed. NOT IN FLOOD ZONE! 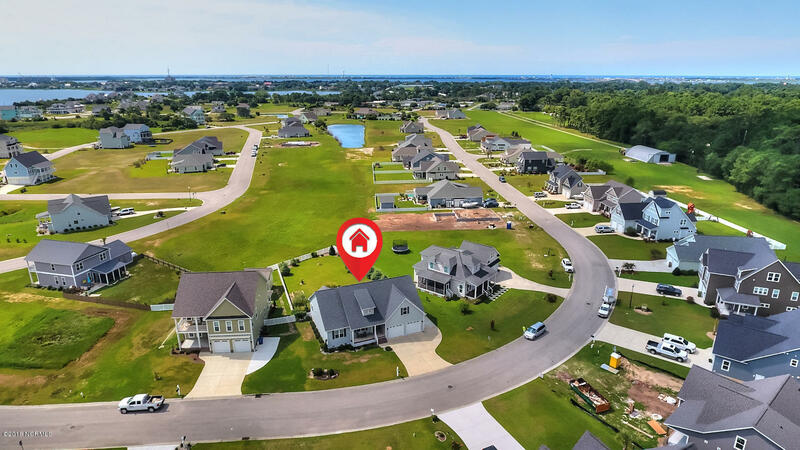 Mariner's Pointe is a waterfront community w/ a short drive to Crystal Coast beaches, historic Beaufort, finest dining, entertainment & spectacular fishing. 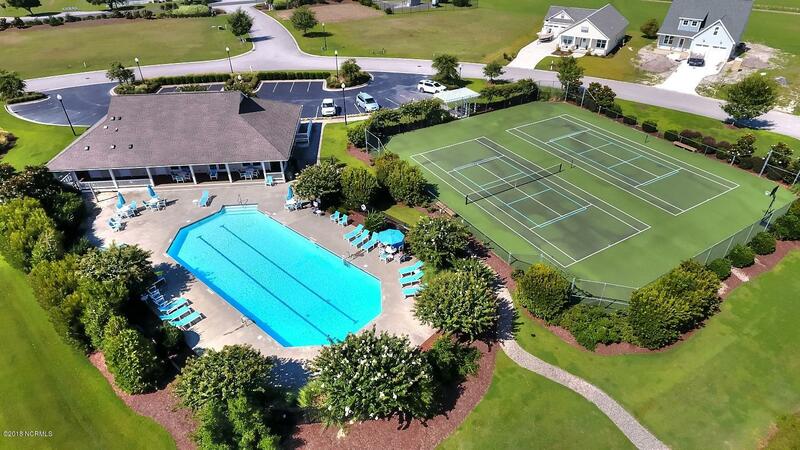 It offers Day Docks, Tennis, Clubhouse & Pool.